Apple’s iOS 7 is really gaining steam when it comes to early adoption, with Mixpanel reporting that it has already passed iOS 6 in terms of traffic hitting its network of mobile sites and apps. Fast software adoption is impressive, but fast hardware pick-up is even more so. 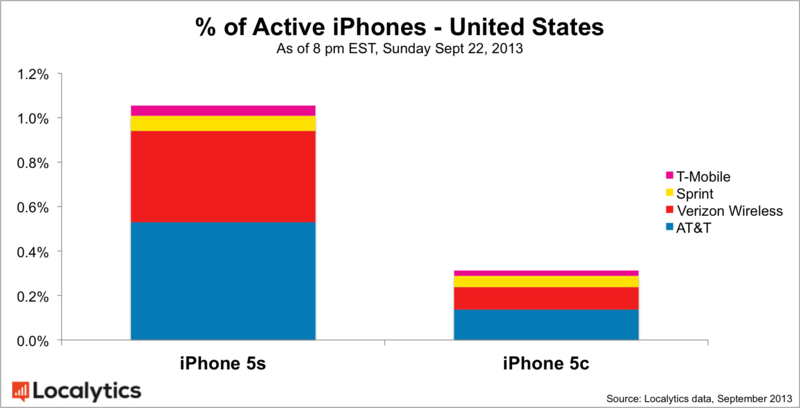 The iPhone 5s and 5c appear to be selling well, according to Localytics, having climbed to 1.36 percent of all U.S. iPhones in less than 3 days on the market. 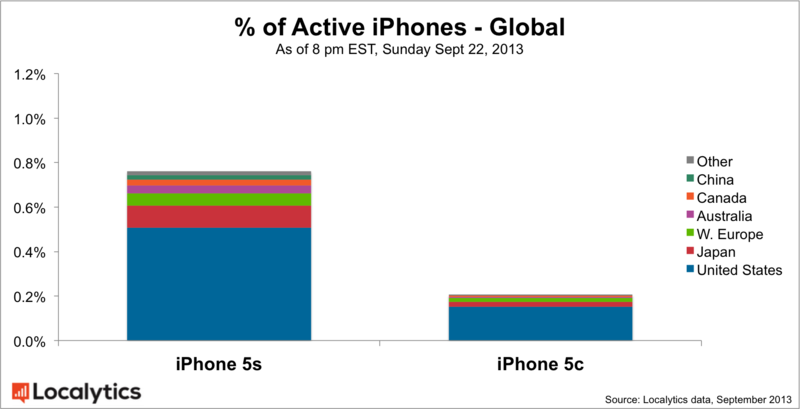 Localytics has surveyed data from over 20 million unique U.S. iPhones, beginning on iPhone 5s/5c release day on Sept. 20 and ending at 8 PM ET on Sunday, Sept. 22 to gather its results. The findings indicate that both devices have had a strong opening weekend, when you consider that the most recent generation of iPads, including the 4th gen iPad and the iPad mini, accounted for around just 4 percent of all iPad traffic a full month after its launch. Localytics also broke down iPhone 5s and 5c adoption by carrier, and found that AT&T had the highest buy-in rate, with the 5s and 5c making up 0.67 percent of all phones on the network. And probably not surprisingly, given the number of stock outages reported for the iPhone 5s, it is leading the way on the Localytics platform by a fairly wide margin, representing 1.05 percent of all U.S. iPhones, while the 5c trails with 0.31 percent of the total breakdown. Aside from comments on Twitter and other social media sites indicating the 5s was in higher demand and shorter supply, a conversation with an Apple Store employee this weekend at the Covent Garden location in London indicates that the 5s was sold out very quickly, with many 5c units remaining in stock as of Saturday. The 5s was almost certainly supply-constrained at launch, but Localytics’ data indicates that it selling out at locations worldwide was down more to demand vs. there just not being enough stock. And while it might be tempting to say that based on these early figures and the evidence from cumulative store reports that the 5c isn’t selling well, it’s worth remembering that the cheaper device is likely aimed at a more broad consumer category that won’t be as concerned with getting their phone ‘first,’ at the earliest possible date. Apple has yet to reveal its launch weekend numbers, but if history is any indication, it should issue a press release detailing launch weekend numbers sometime later this morning.